Happy Mondayyyy! You look like you could use some vitamins. Just like the title says, I have a wee announcement for you. Don’t be silly, it has zero things to do with buns, ovens, rings, escrow, contracts of any kind, the lottery (much to my dismay), or anything that rhymes with shmuhmitment. I’ll give you a hint: I’ve gained roughly 5 pancake pounds. Ah heck with it, I’m writing an e-book! The topic is super top secret, hush hush, not going to let the cat out of the bag just yet, don’t want to spoil the surprise, it’s on pancakes. For real. I’m writing a gluten-free pancakes e-book! …and possibly waffles and/or other breakfast-y foods you can slap down on a plate and slather in fruit, syrup, and/or bacon fat and runny egg yolk. Can you tell my book is already super well-structured? Since we’re on the topic, do you prefer waffs over hotcakes or hotcakes over waffs? What about quickbreads? Dutch babies? Enchiladas? Just doing my market research. Those of you who have been going steady with me for a number of years know I used to post a gluten-free pancake recipe every Friday. The obsession is real. Get pumped and primed. Stock your pantry with GF flours, because we’ve got stacks on deck and this ish is gonna boom clap you in your facetrap. I’ve been eating 98% of my weight in pancakes and supplementing the other 2% with greens, sweet potatoes and eggs. So basically, I’ve been eating breakfast for all the meals. It’s refreshing. How do you take your eggs? Do you like a little run in your yolk? Skip the eggs and get ya a blueberry muffin slash blueberry pancakes? I normally prefer my eggs scrambled and chockablock full of veggies – always with sweet potato and some form of leafy green. Served with avocado and salsa for an epic win. Recently, I’ve been going the same route but taking a deconstructed approach. I simply roasted up a sweet potato (which can be done while you’re watching your 18th sequential episode of White Collar), sauteed up some greens, and stuck the veggies in a bowl with sunnyside up eggs, avocado, and crunchy sunflower seeds and chia seeds. These bowls can be thrown together in 5 minutes flat if you roast the sweet potato ahead of time (one large sweet potato lasts me about 4 breakfasts), making them a great meal to wolf down before your busy work day begins. Don’t skip the seeds! Let’s talk about beet greens for a hot minute. What the heck are they? They’re the stemmy greens attached to beets, you’uns! 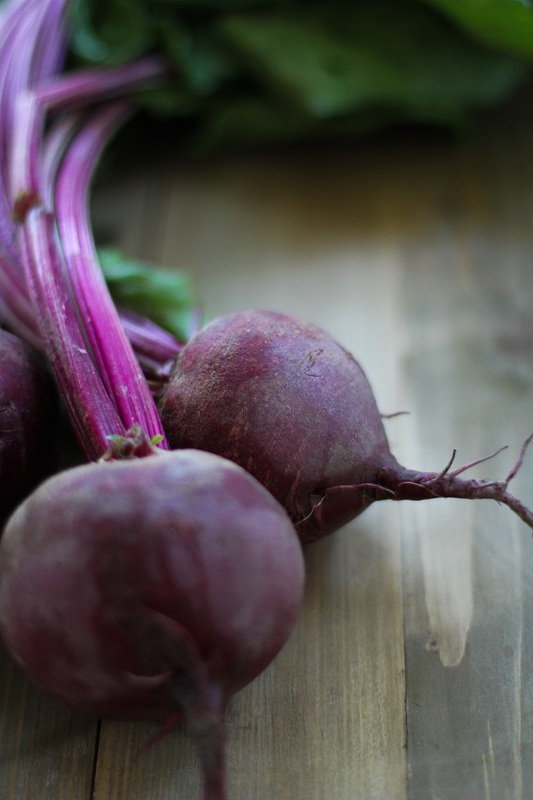 All of us who have bought a bunch of beets are guilty of chopping off the greens and tossing them in the trash. Those greens are packed with nutrients, and needn’t be thrown away! I love using beet greens in salads, stir fry, or in breakfast scrambles. 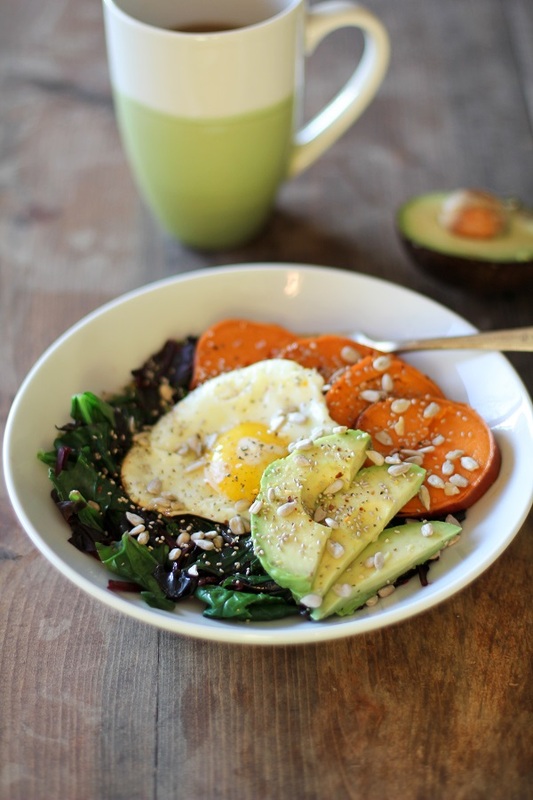 For this breakfast bowl, I used a combination of beet greens and spinach. If you don’t typically buy beets, you can simply use additional spinach, kale, or chard in place of the beet greens. It’s your bk bowl and you’ll green how you want to. I solemly swear I won’t make pancakes out of beet greens. But I can’t say the same thing about kale. Wash and pat dry the sweet potato. Poke holes in it using a fork, wrap it in foil, and bake in the oven for 60 to to 70 minutes, or until very soft and juices are seeping out. Remove potato from the oven and allow it to cool before removing the foil. Slice it into thick slices and set aside until ready to use. In a large skillet, add the oil and heat to medium-low. Add the garlic and saute until fragrant, about 1 minute. Add the chopped greens and spinach and cover the skillet with a lid. Allow greens to cook until softened, about 2 to 3 minutes. Divide greens between 4 bowls. 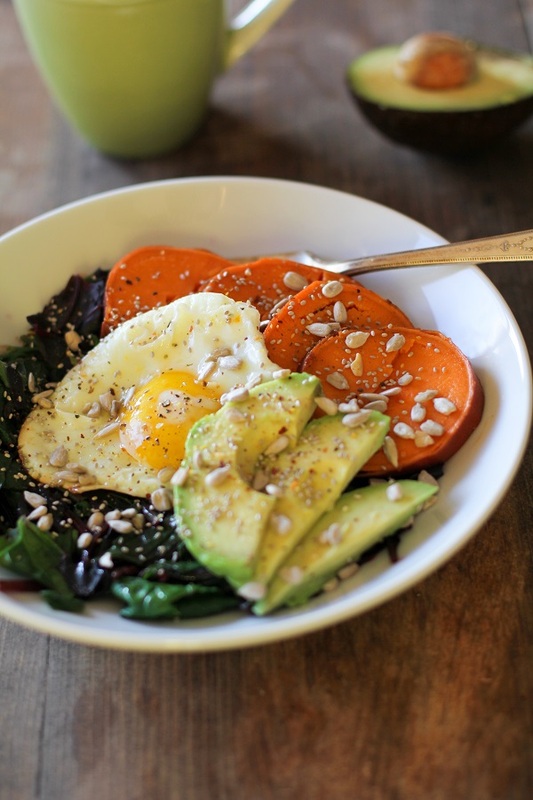 Add sweet potato slices, avocado, and fried eggs. Serve with sunflower seeds, chia seeds, salsa, and/or a dollop of sour cream or plain Greek yogurt. Your Friday pancakes were what made me fall in love with you <3 Can't wait for the ebook! Until then, dippy runny egg yolks allll dayyyy. YAY! Congrats girl, all the pancakes, allllll the time!! I vote anything sweet for the book, bring it on! Thanks, m’dear! It’s definitely been a fun process whipping up pancakes so far! Will definitely be adding some savory recipes in the book too, but there will be plenty of sweet options, to be sure! Congratulations on your e-book! Even though I can’t deal with the idea of serious greens for breakfast (outside an occasional smoothie) I love the idea of this bowl. I could see using rice and left-over veggies, like roasted cauliflower, and many other possibilities. This would make a great lunch. Thanks, Susan! Yup, leftover roasted veggies would be a marvelous addition to the bowl! So many options! Dwwhhaaaaaat that eBook sounds like it’s going to be AH-MAZING. I can’t wait! Savory breakfast (and pancakes) for the win!! Congrats, Julia! Well it just makes perfect sense that you would write a book on gluten-free pancakes because you are the pancake QAWEEENAH! I can’t wait to see how beautiful and amazing it is! Now about these bowls. I’m always looking for ways to use up beet greens and sneak some veggies into breakfast so they look purrrfect to me! Actually, I might have to eat it for brinner too. Actually, all the meals because it looks so dang good! Haha! I do love me a stack of hotcakes, that’s fo sho. Glad you like them bk bowls. They’ve been my love language as of late. DUTCH BABIES!!! omg roasted root dutch baby recipes would be a true dream come true. LOL, you got it, Emma! Roasted root dutch babies you will get! Whoop Whoop! Pancakes for life! I am going to withhold from pancakes until your ebook so I READY for some cakes! Just kidding, that would be torture. Can’t wait for you book and congrats! So excited for you, my friend! Can’t wait for the ebook! And I love the idea of this bowl! 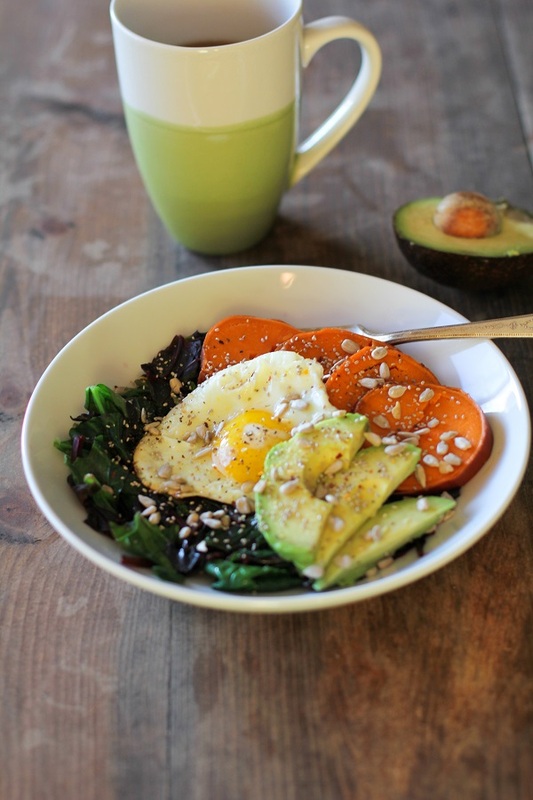 Great idea to sneak some veggies into breakfast!! So tasty! Oooh, this ebook sounds right up my alley! I never really know how to go about gluten/grain free pancakes so I usually dont even try – the few attempts I’ve had havent really been very successful! I usually instead go for an eggy dish – usually scrambled or with the yolks cooked through (runny yolks creep me out, Im shuddering right now thinking about them! 😉 This savoury egg bowl looks very much like my idea of a perfect breakfast – until I work out how to nail a healthy-ish pancake that is, haha! Wowza, I thought you were going to say you we’re pregnant! I just got the call last night that my son and his wife are expecting, so I’m a little disappointed in you! Okay, I’ll settle for GF pancakes. Dang. Give me all the vitamins!! And a huge freaking CONGRATS on writing a pancakes e-book! If it’s anything like your other books, it’s gonna induce ALL the drool and make me eat ALL the pancakes. No complains there. So excited for you love! This is possibly one of the most exciting things to happen since sliced bread!! YES. Yummers! 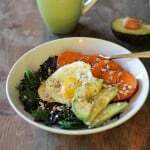 I love savoury breakfast bowls and this sweet potato situation is right up my alley. I don’t have access to beet greens at this time of year, but lots of kale and chard and whatnot. I’m gonna get into it! Pingback: Top 6 Leafy Greens for Heart Health with Recipes Too!